Today’s post examines McCarthy’s responses to Vitter’s questions about the administration’s motor vehicle mandates. As in Part 1, I begin with an overview of the issues and political back story. For more detailed analyses, see the House Government Oversight and Reform Committee report, A Dismissal of Safety, Choice, and Cost: The Obama Administration’s New Auto Regulations, and my article, EPA Regulation of Fuel Economy: Congressional Intent or Climate Coup? McCarthy, testifying under oath before the House Government Overight and Reform Committee in October 2011, denied that motor vehicle greenhouse gas emission standards are “related to” fuel economy standards. Yet anyone with her expertise has to know that greenhouse gas motor vehicle standards implicitly and substantially regulate fuel economy. Why does this matter? The Energy Policy and Conservation Act (EPCA) expressly preempts state laws or regulations “related to” fuel economy standards. Yet in July 2009, the EPA granted a waiver authorizing California to implement the State’s motor vehicle greenhouse gas emissions statute, AB 1493. McCarthy could not give truthful testimony without casting doubt on the legality of the waiver, AB 1493, and the administration’s motor vehicle greenhouse gas/fuel economy program. Perhaps as important, the waiver gives the administration power to threaten and intimidate the auto industry — an asset of immense value in global warming politics. The falsehood that motor vehicle greenhouse gas emission standards are not related to fuel economy standards is, therefore, an unshakeable tenet of Team Obama’s company line. EPCA delegates the power to prescribe fuel economy standards solely to the National Highway Traffic Safety Administration (NHTSA). The waiver did more than authorize the California Air Resources Board (CARB) to poach NHTSA’s statutory authority. It also authorized other states to opt into the AB 1493 program. Consequently, the waiver ginned up the scary prospect of a market-balkanizing, state-by-state, fuel-economy patchwork. This is somewhat paradoxical, because only two sets of standards are permissible under the waiver: federal and California. However, each automaker would have to reshuffle the mix of vehicles sold in each “California” state to attain the same requisite fleet-average MPG or grams CO2/mile. If all 50 states opted into the AB 1493 program, each auto maker would have to manage 50 separate fleets. A more chaotic fuel-economy regime — and one more repugnant to the letter and spirit of EPCA — would be hard to imagine. There was, alas, method to CARB and the EPA’s madness. 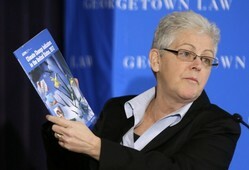 The waiver positioned the White House to demand political fealty from the auto industry in return for protection from the “patchwork.” In May 2009, negotiations led by then-White House environment czar Carol Browner culminated in what President Obama dubbed the “historic agreement.” California and other states agreed to deem compliance with the EPA’s greenhouse gas emission standards as compliance with their own – but only if automakers pledged to support a “national” motor vehicle program jointly administered by EPA, NHTSA and CARB. Circumstantial evidence suggests that access to bailout money was also tied to auto makers’ support for the “national” program, making the “historic agreement” an offer the auto industry could not refuse. We may never know for sure, because, defying the Presidential Records Act, Browner conducted the negotiations under a vow of silence. “We put nothing in writing, ever,” CARB Chairman Mary Nichols told the New York Times. The political payoff for the EPA came in June 2010. The auto industry lobbied against Sen. Murkowski’s resolution (S.J.Res.26) to overturn the EPA’s Endangerment Rule, the prerequisite for all the agency’s global warming regulations. The resolution fell four votes short (47-53), allowing the greenhouse gas regulatory cascade to proceed unchecked. The Endangerment Rule triggered the Tailpipe Rule, which in turn triggered Clean Air Act permitting requirements for major stationary greenhouse gas emitters. The Endangerment Rule also underpins the EPA’s proposed ‘Carbon Pollution’ Rule for fossil-fuel power plants and potentially a host of future greenhouse gas emission standards for petroleum refineries, other industrial source categories, marine vessels, aircraft, non-road engines, and fuels. Ultimately, the Endangerment Rule may compel the EPA to establish national ambient air quality standards (NAAQS) for greenhouse gases. Congress has not approved any of those specific policies, and none would pass if proposed as legislation and put to a vote. Politically if not substantively, the waiver was a key step in launching this far-reaching agenda, and the waiver’s perceived legitimacy depends on the false pretense that greenhouse gas emission standards are not related to fuel economy standards. Let’s now examine McCarthy’s responses to Vitter’s questions on auto regulations. Vitter’s questions are in bold type. McCarthy’s responses are indented. My comments are in blue. To make it easier for readers to check facts and sources, I occasionally insert citations and hyperlinks into the text. The basic fuel economy statute, the Energy Policy Conservation Act (EPCA), expressly preempts state laws or regulations “related to” fuel economy standards. This is a very broad statement of preemption. It prohibits states not only from adopting fuel economy standards, but also from adopting laws or regulations “related to” fuel economy standards. Do you agree? Response: EPA can only deny a waiver of the express preemption provision in CAA section 209(a) based on one of the criteria listed in section 209(b). EPA’s waiver decisions under section 209(b) are based solely on an evaluation of those criteria, and evaluation of whether California emission standards are preempted under EPCA is not among those specified criteria. As a result, in making waiver decisions EPA takes no position regarding whether or not California’s GHG standards are preempted under EPCA. Comment: Nothing in the Clean Air Act authorizes the EPA to ignore the intent of Congress as embodied in other statutes. McCarthy argues as if the Clean Air Act must expressly prohibit the EPA from flouting the letter and spirit of EPCA or else the EPA is free to connive with CARB to restructure the statutory program Congress created. Moreover, unlike other motor vehicle emission standards California has adopted, which measurably improve air quality in the State, the AB 1493 standards will make no discernible difference to climate change risk in California. The State cannot “need” purely symbolic emission standards. For the sake of argument, let’s assume that greenhouse gas motor vehicle standards, like those based on California’s motor vehicle emissions law, AB 1493, are “related to” fuel economy standards. I know you don’t think they are, but for now, let’s assume there is a relationship to fuel economy standards. If there was, would it be lawful for California to implement AB 1493? Would it be proper for the EPA to grant California a waiver to implement it? Response: EPA can only deny a waiver based on one of the criteria listed in section 209(b) of the Clean Air Act. EPA’s waiver decisions under section 209(b) are based solely on an evaluation of those criteria, and evaluation of whether California emission standards are preempted under EPCA is not among those specified criteria. As a result, in making waiver decisions EPA takes no position regarding whether or not California’s GHG standards are preempted under EPCA. Comment: McCarthy evades the question. Logically, her response implies that even if the Supreme Court ruled that EPCA preempts California’s greenhouse gas motor vehicle standards, the EPA would still have granted the waiver, since (according to McCarthy) the EPA may consider only criteria specified in 209(b) and nothing else. Key agency documents and even AB 1493 itself imply that motor vehicle greenhouse gas emission standards and fuel economy standards are closely related. EPA and NHTSA acknowledge in their May 2010 Tailpipe Rule [75 FR 25324, 25424, 25327] that no commercially available technologies exist to capture or filter out carbon dioxide (CO2) emissions from motor vehicles. Consequently, the only way to decrease CO2 per mile is to reduce fuel consumption per mile — that is, increase fuel economy. Carbon dioxide constitutes 94.9% of vehicular greenhouse gas emissions, and “there is a single pool of technologies … that reduce fuel consumption and thereby CO2 emissions as well.” What this analysis tells me is that greenhouse gas motor vehicle emission standards inescapably and primarily regulate fuel economy. Do you agree? Comment: Another evasive response. The fact that the two types of standards are “different” is irrelevant. Two brothers are different people; they are nonetheless related. The Court’s statement — “there is no reason to think the two agencies cannot both administer their obligations and yet avoid inconsistency” — is also irrelevant. The Court was referring to two federal agencies — the EPA and NHTSA. The Court did not affirm that state-level regulations “related to” fuel economy are consistent with EPCA. The framework document for the Obama administration’s model year 2017-2025 fuel economy program, the September 2010 Interim Joint Technical Assessment Report published by the EPA, NHTSA, and the CARB, considers four fuel economy standards, ranging from 47 mpg to 62 mpg. Each is the simple reciprocal of an associated CO2 emission reduction scenario. The 54.5 mpg standard for model year 2025, approved by the White House in August 2012, is a negotiated compromise between the 4% per year (51 mpg) and 5% per year (56 mpg) CO2 reduction scenarios. If fuel economy standards derive mathematically from CO2 emission reduction scenarios, and CO2 accounts for 94.9% of all greenhouse gas emissions from motor vehicles, are not the two types of standards related? Comment: A third evasive response. No matter what substantive information Vitter provides, McCarthy repeats the same boilerplate. See previous comment for a rebuttal. Nearly all of CARB’s recommended technologies for reducing greenhouse gas emissions (Table 5.2-3 in CARB’s 2004 Staff Report on options for implementing AB 1493) were previously recommended in a 2002 National Research Council study on fuel economy (Tables 3-1, 3-2). CARB proposes a few additional options, but each is a fuel-saving technology, not an emissions-control technology. These facts tell me that greenhouse gas emission standards inescapably and primarily regulate fuel economy. What conclusion do you draw? Comment: McCarthy sounds like a broken record. She is clearly unwilling to engage the issue on the merits. In AB 1493 itself, CARB’s greenhouse gas standards are to be “cost-effective,” defined as “Economical to an owner or operator of a vehicle, taking into account the full life-cycle costs of the vehicle.” CARB interprets this to mean that the reduction in “operating expenses” over a vehicle’s average life must exceed the expected increase in vehicle cost (Staff Report, p. 148). Virtually all such “operating expenses” are expenditures for fuel. CARB’s implementation of AB 1493 cannot be “cost effective” unless CARB substantially boosts fuel economy. Do you agree? This question would be best addressed by CARB since it is directed at the state standard. Comment: No, this question is best addressed to top EPA officials, who presumably formed an opinion about the content and purpose of AB 1493 before authorizing CARB to implement it. Again, an evasive response. How does the “national” program created in the wake of this backroom deal comport with congressional intent? Under the statutory scheme Congress created, one agency – NHTSA – regulates fuel economy under one statute – EPCA as amended by the Energy Independence and Security Act (EISA) – through one set of rules – corporate average fuel economy. Today, three agencies – NHTSA, the EPA, and CARB – make fuel economy policy under three statutes – EPCA, the Clean Air Act, and AB 1493 – through three sets of regulations. Where does EPCA as amended authorize this triplification of fuel economy regulation? Response: In Massachusetts v. EPA, 549 U.S. 497 (2007), the Supreme Court rejected the argument that EPA does not have authority to regulate CO2 from vehicles because it would impact fuel economy and concluded that, “the two obligations may overlap, but there is no reason to think the two agencies cannot both administer their obligations and yet avoid inconsistency.” The National Program approach has garnered widespread support from a broad range of stakeholders including the automobile industry, for this joint, harmonized effort. Comment: More irrelevancies. As noted above, in Mass. v. EPA, the Court did not rule on the appropriateness of CARB adopting greenhouse gas emission standards or implicitly regulating fuel economy. Are yous guys gonna come along quietly, or do I have to let the California Air Resources Board muss ya up? Shame, too, if you waz to go broke. Look, everybody needs prodection. Play ball wit us and nobody gets hoit, and yous can walk outta here knowin’ your companies will get doze bailout checks. McCarthy’s responses to Vitter’s questions are not those of a “straight shooter.” She serves up evasion after evasion, irrelevancy after irrelevancy. Almost the only ‘reason’ she provides is an argument from authority, invoking the Supreme Court’s opinion in Mass. v. EPA to justify an EPA action — approval of the California waiver — that the Court did not address. Your statements under oath misled the Subcommittee in understanding the relationship between fuel economy standards and greenhouse gas regulations. The difference between regulating greenhouse gases and regulating fuel economy is a distinction without a difference. . . . By obstinately insisting that greenhouse gas regulation and fuel economy regulation are separate and unrelated endeavors . . . you impede the Committee’s important oversight work. Why did she ‘mislead’ and ‘impede’? To avoid having to admit that the EPA turned the EPCA preemption into a practical nullity and, in cahoots with CARB, restructured the fuel economy program Congress created. Such changes are of a legislative nature and, thus, should be beyond an administrative agency’s pay grade to effect. Senate Environment and Public Works Committee Chairman Barbara Boxer (D-Calif.) lauds McCarthy as “tremendously qualified” for the job of EPA administrator. If the issue were simply one of professional experience, knowledge of the issues, and managerial capability, Boxer would be correct. The central issue, though, is the EPA’s egregious record of dissembling, obfuscation, and overreach during McCarthy’s four years of service as a senior agency official. To be qualified to run a rogue agency, the nominee must above all be a reformer. As her responses to Vitter’s questions on fuel switching and fuel economy reveal, Gina McCarthy is an apologist for the status quo.